Guyanese are almost certain to go to the polls before year-end, now that the opposition has maintained that it would be going ahead with its no-confidence motion in the House when it convenes on Monday. Just three hours after President Donald Ramotar announced in an address to the nation that he would be dissolving or proroguing parliament if the opposition forges ahead with its no-confidence motion instead of addressing several legislative matters, Alliance For Change (AFC) Leader Khemraj Ramjattan vowed that his party would not be backing down from the motion. A Partnership for National Unity (APNU) Leader David Granger reiterated his party’s pledge to vote with the AFC in passing the motion, but accused the President of behaving like a coward by running away from a debate on his tenure. “The solution to the problem of Guyana is not in dissolution. The solution of the problems facing Guyana lies within a debate in the National Assembly and if Mr Ramotar had a problem, he should defend his record in the National Assembly. The solution is a cowardly way to deal with it by running away from the problem,” the Opposition Leader told Caribbean News Desk. Granger flayed the President for obstructing the re-convening of the House after the two-month parliamentary recess ended on October 10 but Tuesday identifying several Bills that were government’s priorities. “It is really a sort of denial of democracy to obstruct the sitting of Parliament for a month and then try to intimidate the Parliament or threaten the Parliament with dissolution or proroguing,” he said. 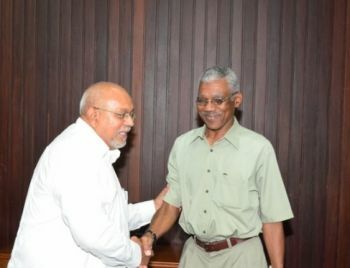 Reacting to President Ramotar’s announcement that Local Government Elections would be held during the second quarter of 2015, Granger declared that that time-line was unbelievable. “I cannot imagine that GECOM (Guyana Elections Commission) would have still needed six months and I am not satisfied with that answer at all. It’s weak and it’s something we are very disappointed in. I can’t believe that it will take six more months for elections to be held. It doesn’t mean our satisfaction,” he said. The practicing Attorney-at-Law explained that even if the President exercises his right to dissolve or prorogue parliament, general and regional elections would have to be called in 90 days- the same period that applies as a result of an approved no-confidence motion. The AFC Leader reasoned that President Ramotar would avoid the debate on the no-confidence motion to prevent the record from showing that his administration was virtually kicked out of office. “He don’t want his lame-duck Presidency to go down in history as having been aborted by the opposition (but) would have been aborted by a self-induced dissolution or a self-imposed dissolution. It doesn’t make a distinction to me, the result would be the same. He has to go,” added Ramjattan. With APNU’s 26 seats, the combined opposition controls the 65-seat House with one seat. The President earlier Tuesday night identified his administration’s parliamentary priorities. They are They are the Anti-Money Laundering and Countering the Financing of Terrorism Legislation and the repercussions of Guyana’s non-compliance on both the economy and the lives of our citizens; the Telecommunications Legislation with its intended Liberalisation of the Telecom Sector; the Education Bill and its sweeping overhaul of public education that lifts every child in Guyana, and Financial Papers providing for expenditure of Public Funds for development projects and improving the welfare of our people. Ramotar, however, added that if the opposition decided to take steps to debate the no-confidence motion he would instead call early general and regional elections constitutionally due in 2016. “I disclose these, my intentions, on the assumption that the post recess sittings of the National Assembly would proceed uninterruptedly, deliberating on the urgent matters I have listed in the interest of the people of Guyana. I also wish to declare that were this not to be so, and I am provided with reasons to believe that the Parliamentary Opposition intends to disrupt Government’s business by forcing a debate on their No Confidence Motion, I resolve to respond immediately by exercising my Constitutional options to either Prorogue or Dissolve Parliament paving the way for holding of General Elections,” he said. Opposition Leader Granger last week called off talks with the President on Local Government Elections, citing an address by Ramotar in which he had said that it was a waste of time to call the local polls.